Dark-Readers: Crossroads by Mary Ting: Review and Giveaway!! Crossroads by Mary Ting: Review and Giveaway!! Review: I have never read any books about angels before, but after reading this book, I definitely will! Crossroads lets a person's imagination explore a a world where only books can take you. Crossroads is a wonderful Young Adult book that could be categorized as a Paranormal Romance. Speaking of Paranormal Romance, the two main characters in Crossroads, Claudia and Michael are wonderful! I absolutely fell in love with both these characters. In the beginning you automatically want to dislike Michael, but can't help taking a liking to his personality throughout the book. Claudia is a girl who I believe most teenagers could relate to, besides the fact that she has a special supernatural gift, that even she is unaware she has. Although there were characters that I could not stand due to their greed and lies and pure evilness, Mary did a fantastic job at writing the part of Aden, a Fallen who is after Claudia. For first time, self published author, I was impressed. I loved the way author Mary Ting wrote; she added so much detail into the story that made a reader feel as if they were actually there. The writing was fun but at the same time there were tidbits that were suspenseful and serious. This book is a page turner, unfortunately at the time I was reading I was busy and had to allow myself to read only several chapters at a time, which was very difficult to do! So I recommend having a day or two filled with nothing but reading Crossroads. The ending will have you wanting more! I would recommend this book to anyone! Crossroads is a fantastic YA book. It goes beyond the cliched paranormal romance and makes a person question the true meaning of love, life and religion. 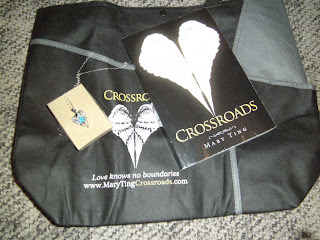 Mary Ting was nice enough to let Dark Readers do a giveaway of her new book Crossroads. Crossroads is self published by Mary; It will be getting republished later on this year (so keep an eye out for another giveaway!) but we want to let you have the chance of winning a SIGNED, first version of Crossroads, a beautiful Swarovski heart necklace, and a Crossroads bag. Contest will end at 12a EST USA time on July 12, 2011. This sounds so good (loving the Michael-factor, shout out to my husband! :D ), I'd love to be in with a chance to win a copy! Crossroads sounds like an amazing book. Angels and supernatural powers?? I'd love to win this!! Oooh this book sounds great, and Michael sounds even better ;) I like that you said the reader feel as if they were actually there, I love that kind of books. Crossroads sounds like such an intriguing read. I want to immerse myself in Claudia's world already. Great review! 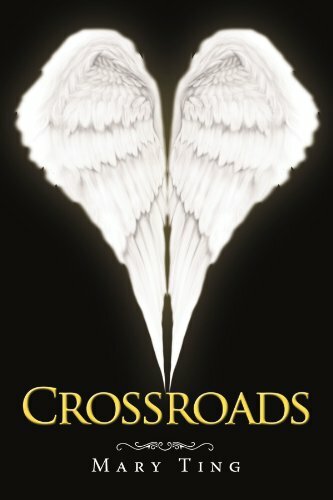 The truth is I don't really like books about Angels but Crossroads seems very interesting. I have obsession with paranormal romance and I think this story is for me. A nrw author to me but the book sounds as if it would be a good read so please enter me in the giveaway. I have been wanting to read this book for awhile now! And then your review sealed the deal! :D Thank you for the giveaway! I am really glad you liked it! I have read a few angel books and I have had some serious disappointments. I am glad this author pulled it off, I can't wait to see for myself. I've been having a hard time committing to angel novels lately but this sounds really promising. This book sounds really interesting! I'm a fan of angel-related books, so I'm definitely looking forward to this one! Crossroads sounds really good! I've read a few angel novels and I'm looking for some new candidates to share on my blog! Thanks for the contest! Pick me. :) Sounds like a lovely novel. I am really wanting to read this! This book sounds so good! I have read some good books about angels and some bad so I'm always open to a new one! I love characters that change through out the novel and change your opinion of them. Sounds like the kind of book I could get into! thanks for the review and a chance at a great giveaway package! I love reading angels and love stories. Im sure that i will love this book if i win it. First vampires(in popularity) and now i believe that angels are going to take the first place spot for popularity. More and more novels are about angels. I cant wait to read this. I read some teasers on Mary Ting's FB and they sound great. I would really like to read this novel. Great giveaway. Angels, fallen angels, topics like this are my favorite to read in novels. I have not read any angel novels yet, so this would be my first. I would love to win to get a chance to read this. great give away rossroads sounds like an amazing book. Angels and supernatural powers?? I'd love to win this!! It sounds like a fresh new take on angels. I like the concept of Crossroads. Love to win this. What a great plotline. Sounds like a good read to me!!!! WOw! Great prizes to win. I would love to read this book. IS there going to be more from this series? Hope Mary Ting writes more books for this series. I've never read any YA about angels before, too, so I will keep this book in mind! Great interview. I'm looking forward to reading this book! Eep! I LOVE books about angels and what not. This sounds so exciting. Can't wait to read it. I'll have to keep this book in mind! Romance, guardian angels, and the supernatural. Cool! I'm seeing more and more about this book every day. It sounds great! Can't wait to read it. Thanks for the chance to win. Crossroads sounds very interesting, I can't wait to read it. I would love to win this!! !